Review: This is my 7th time reading this book and the first time properly reviewing it. The fact that I’ve read it so much tells you something, and that something is that no matter how old a book is, if it’s a good book we must not put it on a shelf and forget about it. There are so many new readers to this genre and sometimes it’s just good business, or in this case, a public service to keep this one on the table. Obviously, not everyone loves the same thing, but K.A. Mitchell, and the Ohio series is still, years later, one of my all-time favorites. Sean and Kyle immediately called to me because they are disgustingly happy six years into their relationship. Established couples are a rare breed and though I like to read about guys meeting for the first time and falling in love, I also love to read about the established pairs dealing with real life issues that test their relationship and find their way back to each other. In this case, Sean, a high school teacher, is involved in a school shooting and is injured then instantly touted as a hero. Kyle, his biggest fan, is scared to death of having their faces, especially Sean’s, plastered all over the national news. Not everyone is happy to read about a gay hero. 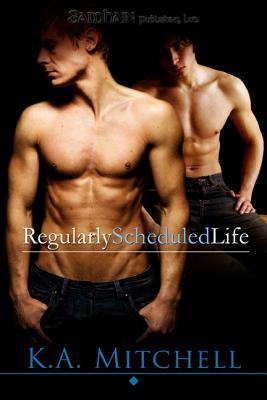 But, lucky for them, Brandt, a public relations expert convinces Sean that he needs to get ahead of the ball and put his story out there before it’s twisted…of course, Brandt has a lot of money to make off Sean, and Kyle knows it. To him, Brandt is sleazy, to me, Brandt is sleazy, to Sean, Brandt is helping him showcase gays in a positive light and earning him a couple pennies at the same time. Kyle just wants to go back to his regularly scheduled life where he and Sean are safe. My heart went out for Kyle. He needed as much comfort, if not more, than Sean. But, Sean was the one shot so Kyle is just viewed as being petty, at first. Sean was really not the good guy at home. Even though I loved him, and he was my favorite between the two (odd, I know), he still needed to speak up with his internal fears. His desire to not depend on Kyle was paramount to pushing Kyle away, he just didn’t see in time. And allowing Brandt liberties he would not allow Kyle really irked me. But, I got it. He wasn’t trying to be jerk, but he clearly was not thinking straight. These two go through the ringer, but in the end, Brandt is gone and Sean and Kyle are the committed couple that began this story. It was not easy, and it was not pretty, but sometimes you have to lose the best thing that ever happened to you in order to move forward. I love this book and will probably read it again. That right there tells you more than this review.